Governments are still in the business of producing posed photographs, and many of those look posed, but not many look as if they were posed 60 years ago. For that, you have to go to North Korea. It’s no secret that North Korea is living in a relative dark age–literally, when you see satellite photos of it at night, and in many other ways as well, not least in having a gulag of prisons in which hundreds of thousands of people have been tortured, murdered, and worked to death. But nobody’s perfect, right? I can hardly believe that I’m posting on this photograph, which is a standard propaganda image that puts a smiling face on a brutal totalitarian regime. Most of the time, this blog tries to feature photojournalism as it is an artistically and politically significant public art. I select the images almost solely because of how they stop me, grab me, speak to some part of me. I begin with that intuitive, emotional reaction, load the image into the WordPress software, and try to figure out what the photo has to say. No art can avoid repetition, and journalism couldn’t exist without it, but for the most part you won’t see me spending my time ruminating over stock photos taken by a government news agency. Of course, when the photo is of Kim Jong Un, the door is wide open for ridiculing the Dear Leader, and there are plenty of examples of that around, but cheap satire hasn’t been our thing at NCN either. So there must be something to this photograph after all. I’ve seen many others of the Dear Leader–he seems to be stock figure, or running joke, in the slide shows–but none caught my attention. So what is it? Let me suggest several answers that reflect various dimensions of the photographic encounter. Perhaps the first hook is the contrast between the smiling figure in the center of the group and everyone around him. He’s having a ball; the others, not so much. That simple distinction comes out of photography’s most basic elements: its combination of focus and frame to depict the behavior and relationships of vernacular life. Those relationships often are layered, as here we see the conventional groupings of the posed photograph, the work team, a celebrity mingling with the little people, and the political leader visiting the provinces. Each of these in turn suggests that additional information or insight may be available: we can see modern image culture, the less than impressive soldiers in what looks like a make-work group, the fact that Un actually has picked up a thing or two from the Western media, and an allegory for the distribution of happiness in North Korea. The next dimension of the photo becomes evident if we step back to consider a sense of historical context, as then the retro look is particularly obvious. The photo’s composition goes right down the checklist for Taking Good Pictures: vertical interest on the right, horizontal interest on the left, etc. 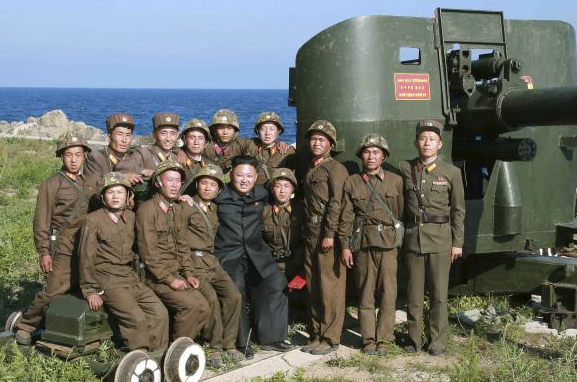 The green gun mount and boxy/baggy uniforms have 1950s written all over them. As does the setting: coastal defense, who does coastal defense today? Artillery, that’s your high tech? And look at that blue water: shouldn’t they be putting up a seaside resort? North Korea is not exactly a leader in resort development, so we are left with something else: a photograph of the way the world used to be. As with much else in that sad place, photography in North Korea can be a trip down a worm hole into the past. This is not photography as an aide-memoire, but rather an image of what still persists even though we would be better off without it. The world today is a mess, but at least the relative “innocence” on display in this photograph from North Korea is rarely an option. It’s just a photograph, but consider how much repression has to be in place for it to exist as it does. From this perspective, the photo becomes a form of documentary evidence, a valuable addition to the archive. This is how a nation looks, when it shouldn’t look that way at all. Photograph by the North Korean Central News Agency.